All Geeks Rejoice: Leak Sauce #10 Mirrodin Pure or New Phyrexia? The third set in the Scars of Mirrodin block is either going to be Mirrodin Pure or New Phyrexia. Wizards of the Coast knows the outcome but won't give it away just yet. For now, the set is codenamed "Action" (to finish the codenames of the block: Lights, Camera, and Action). I'm here as usual to give you the facts and some spiffy artwork I've gathered here. - The two pieces of art at the top of this page belongs to Melira, Sylvok Outcast and Phyrexian Metamorph. - Melira is in fact the very Sylvok girl that Thrun, the Last Troll is training. He believes she may help tip the scales of the current war due to her unique nature. She happens to be the only being on Mirrodin to not be born with any metal skin. 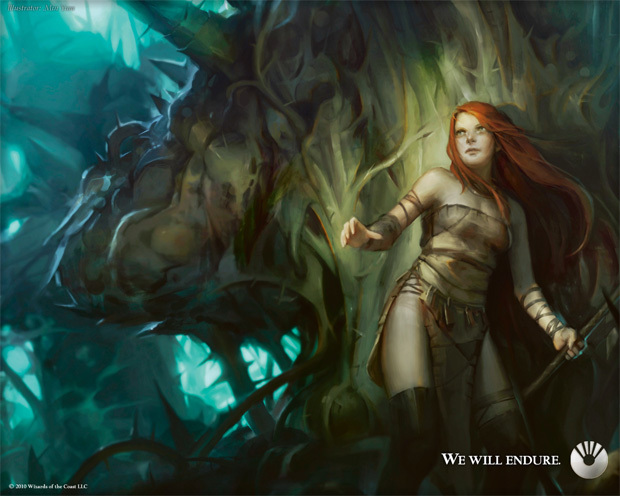 Her artwork proves she is NOT a Planeswalker as many believed her to be. - Tezzeret's profile page in the multiverse section of the main website has been updated. Tezz was sent to Mirrodin by Bolas to monitor the Phyrexians and prevent a leadership from taking hold. He has since used his wit to establish himself in the Phryexian hierarchy to gain power for himself. He isn't working for the Phyrexians and will most likely manipulate them as he pleases. - Karn is currently being held in the core of Mirrodin by the Praetors as their leader. On a good day he typically spouts insane mutterings as the Praetors whisper twisted psalms into his head as they await for him to fully become the new Father of Machines. Imagine what a bad day would be like. "The plane of Phyrexia was all but destroyed when Urza's Planeswalker allies devastated it during the Phyrexian Invasion of Dominara. But that was not the end of Phyrexia entirely. Yawgmoth and his minions ensured that Phyrexia would endure by creating an insidious colonizing weapon known as "the oil". When Karn unknowingly introduced the oil to Mirrodin, Phyrexia was reborn." "Access to Mirrodin's interior core of pure mana enabled Phyrexia to accelerate its unnatural evolution in a matter of decades. 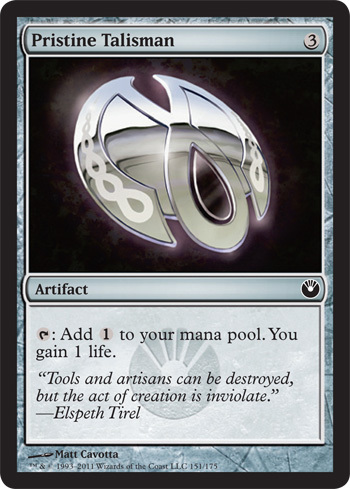 But Phyrexia is changed by the world of Mirrodin. In its original system, Phyrexia had access only to black mana. Here on Mirrodin, Phyrexia has evolved along each axis of mana color, creating factions in the formerly monolithic threat. This has made Phyrexia both stronger and weaker than before- stronger because it's more varied and adaptable, weaker because it now lacks the unity of purpose it once had." "Led by Elesh Norn, the white-aligned faction believes that Phyrexia must adhere to the teachings of the Father of Machines. They intend to indoctrinate everyone about the truth, even if it means tearing them limb from limb and reattaching the parts into a creation that is worthy of Phyrexia. They are dogmatic, hierarchal, and orthodox in their methods." "Led by Jin-Gitaxias, Augur of the Core, the blue-aligned faction uses experimentation to find the ways to perfection. They are clinical, methodical, and research-orientated, with no sense of compassion for the creatures they mutilate in the name of the True Science. They collect scores of research subjects and perform gruesome tests, all in the name of progress." "Led by the mysterious Sheoldred, Whispering One, the black-aligned faction has one goal: enslave. Believers will serve. Unbelievers will be made to serve. All will bow to Phyrexia. 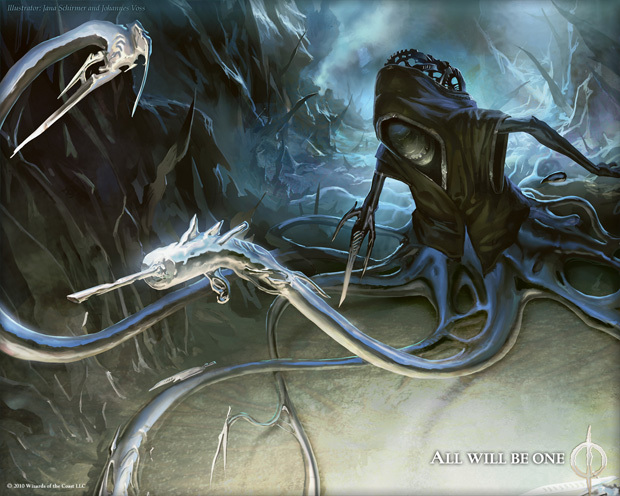 Geth, the undead lord of the Vault of Whispers, had embraced Phyrexia long before the rest of Mirrodin knew the threat. Now, he controls a vast army of undead in service of their goals." "Under Urabrask the Hidden, the red-aligned faction rejects the hierarchy and order of the main Phyrexian leadership. They cultivate industry and birth-furnaces, which will reforge the world in their perfect vision." "The green-aligned faction aims to create a natural state in which predation will thrive unhindered. Vorinclex, Voice of Hunger, seeks to eliminate sentience in favor of power. Consumption and strength are all that matter in the Tangle now. To accomplish his goals, Vorinclex has a powerful and ruthless ally: Glissa Sunseeker has become Glissa, the Traitor." "Elesh Norn's church is a mockery of all faiths. She is like a child who has watched her elders from the other room at an important meeting. She sees the ritual but knows not the intent. And like a child, she scrambles to her room and replicates what she saw with her toys, pretending to be like an elder in a meeting, though she's only going through the motions. "Her pretext of faith as justification for her actions is a flimsy delusion continued only by her misunderstanding of life and Phyrexia's true purpose. Take a look at her angels, vicious and effective soldiers I shall admit, but unnecessary in form and function. "The angel was a messenger to the heavens, bestowing grace and mercy to believers. Even in the depths I know this. In Elesh's fantasy to be a true church she must also have angels, even if they no longer bestow grace and mercy. They have the shape of the messenger, though they have nothing to say. Her fractured religion serves only as demoralizing propaganda to willingly covert a few and expends precious resources modifying the forms of her minions to fit her religious theme. "The others think Urabrask is an arrogant fool who is simply spoiling for glorious battle with the Mirrans. But I'm not so sure. ...There is just enough method to his madness to leave me wondering. I see an endgame here... and I do not like it." Above: An upgraded Blood Seeker with half of a Soul Warden attached. Above: An upgraded Marble Chalice. Sorry for the late edit but things have been rather hectic. At this point, these spoilers aren't all that new anymore but I figured I would add them to the pile regardless. This is Kylak signing out and hoping you're ready for whatever may befall the land of Mirrodin.